It is that time of year again! Today marks the beginning of San Diego Comic Con, and I am very happy to say that I will be there in the same place as last year (Small Press Table O-15) with lots of prints, Confetti books, a few originals, and more on hand. The image above is one of the new prints I will have with me, and it is even embellished with gold ink! I will also be helping with portfolio reviews for Walt Disney Animation Studios on Friday from 12-2:30pm, so have those portfolios ready! Also, I will be doing a special signing with Gallery Nucleus (where we may even have a new, Nucleus exclusive print) at their booth on Saturday from 12-1pm. If you want to have the most up-to-date info from me on what is happening at the convention, follow me (@britsketch) on Twitter and Instagram! It is going to be a crazy, fun, exciting week! If you happen to be in San Diego, I hope to see you there! Wow! So happy for you girlie!! Congrats! If we can't make it to Comic Con is there anywhere else we can order from? This illustration is very gorgeous and poetic ! I adore it. Your works inspiring me so much, I'm jpin your site! Beautiful artwork! All the best! This is really lovely.... 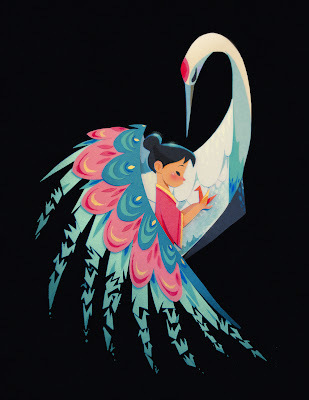 The swan n girl is so pretty! Everyone loves your work so much! Do you have any demo videos of you making a paper sculpture? I would love to see the process of how you work. oohh! so pretty. It looks like paper sculpture. It was so great to meet you and your husband! I love, love, love your work! And, as I told your husband, I wanna see a 70's, 80's, and 90's illustration for the dancing couple. Just saying:) Have a great one! Wow! it's gorgeous!! I live out in Boston and can't make it to Comic Con, will you be selling it on Etsy!? pleaseee! :D best of luck! your artwork is amazing!! My girls really liked the little bird buttons on a cage card. Very cool. Your artwork is beautiful & amazing. I hope that I can get my own paper art as detailed as yours. That's amazing. Knocked it out, hard! Great piece! I like the colors and the layout! outstanding!! lokking so well, amazing illustration! I was suppose to go to comic con but something came up last minute and I was unable to attend. I really love your prints and was looking forward to visiting your booth. I was pretty excited to see if you had used any of your work to create some huge banner stands. I feel like your stuff would look so cool blown up on a huge display. Keep up the great work and Hopefully I'll see you next year! oh my god! I just discovered you and you left me speechless ... I am amazed! Yesterday, I had the privilege of meeting the exquisite Brittney Lee at the Wondercon Anaheim. Besides being an extraordinary artist she is also so great to her fans!! I got this and a few more artwork that are rocking my tv room walls!! Definitely my favorite artist! Just perfection! !Brittney Lee rocks! Yesterday, I had the privilege of meeting the exquisite Brittney Lee at the Wondercon Anaheim. Besides being an extraordinary artist she is also great to her fans!! I got this artwork and a few more artwork that are rocking my walls!! Definitely my favorite artist! Tak for, at den bedste blog var meget nyttig for mig. Fortsæt med at dele sådanne ideer i fremtiden. Tak for at give mig den nyttige information. Giaonhan247 chuyên dịch vụ gửi hàng đi campuchia, gửi hàng đi lào, gửi hàng đi đài loan cũng như và dịch vụ vận chuyển hàng đi mỹ cũng như dịch vụ gửi đồ đi mỹ uy tín, giá rẻ. Besøg dit websted ofte. Skrivestilen er overlegen, og indholdet er af høj kvalitet. Tak for det indsigt, du gav læserne. Tak admin! When it comes to video downloaders, most users worry about their security. However, this shouldn’t be the case for Snaptube.